In the build up to AdFest 2018, we will be announcing more and more Jury Presidents and Judges draw from leading advertising and design professionals from around the world. 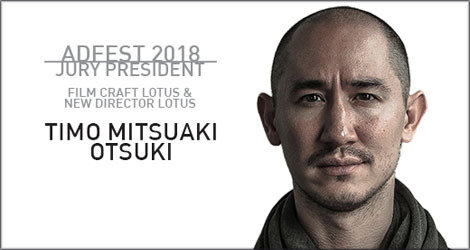 Timo Mitsuaki Otsuki, the Executive Producer from Cutters Studios in Tokyo will be the Jury President for Film Craft and New Director categories. Otsuki grew up living in between Germany and Japan. He speaks German, English and Japanese. His multicultural experience makes him an ideal choice to lead the panel of juries considering work from all around the region. Established in 1980, Cutters Studios is a collection of brands in five cities (Chicago, Detroit, Los Angeles, New York and Tokyo), all of whom work together to provide production and post production services. Otsuki has helped grow the company’s influence across Japan’s creative landscape since he joined Cutters Studios in 2012. He believes that no-nonsense, honest communication is key to effective commercial filmmaking, and sees problems as opportunities. Other Presidents and jury members will be announced later.